Exile, Essenz, REIGN + More! SPIRIT + REIGN + SALE! There is a FLASH SALE going on at the Blueberry sim and also at REIGN! Until midnight tonight! Select items are 50% off so hurry over and grab them. pose & props by Fashiowl Poses – Love Puppies *new* at Tres Chic. photos taken at Floris. Black Friday Sales in Second Life!! This is a quickie blog post, because I have more black friday shopping to do! 🙂 Be sure and check Seraphim’s Black Friday Sale list to see if your favorite stores are offering discounted items! coat & under clothes: cold logic – koby.pink *new* 50% off for black friday!! leggings: cold logic – adler.salmon *new* 50% off for black friday!! 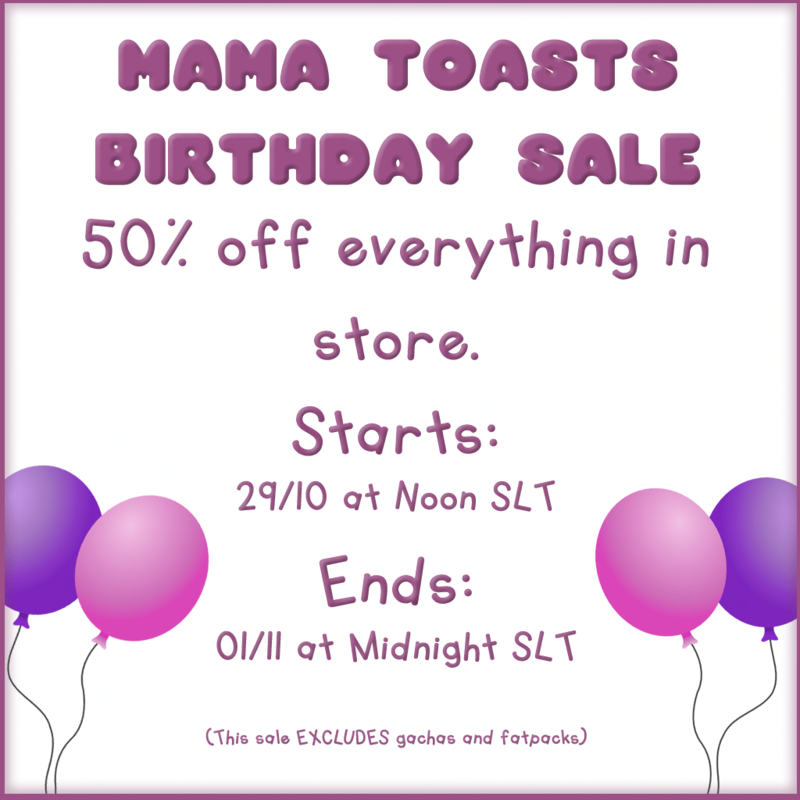 Buttery Toast Birthday Sale and Newness!! Buttery Toast is having a birthday sale! Yay! The sale starts today and goes through November 1st. Happy Birthday Faylinn! The clutch I am wearing is a new release from Buttery Toast, stop by the sale and grab a bone bag before Halloween is over! I will be so sad when November starts… I have had such a fun time the past few weeks in SL. The parties were great! Durdeedurdedurr! Even if my internet did keep going out on Saturday night, I still had a lot of fun. skirt: even flow – Zip It Skirt *new* item was at Vintage & Cool fair, hopefully in mainstore soon! ps carl poppa is STILL in my head. Wow. It’s been two weeks or longer since I’ve had the time to blog! I’ve been keeping busy in RL with work and working on my RL blog… it’s still nowhere near ready to launch. Hmph! I have another darling pink outfit for you today. Please forgive the photos, something weird is happening when I use advanced lighting model and I wanted to get a post up, so no time to troubleshoot! The hair is from Little Bones and it is possibly my favorite hair that Nova has made to date. It is Winehouse-esque. LOVE IT. The dress is from Epic and the shoes are NEWWWW from half deer at this months Collabor88 (I still need to go back and get a ton more!). The yummeh sundae inspired shoes come with a color change HUD for the heels so you can mix and match with your outfit. The nailpolish is available from Bella Elephante at the Fit For a Princess event which runs until May 24th. My other makeup is from a.e.meth and everything in their store is only $10L right now, so be sure to hit up the store closing sale. Details and pics below! poses by elephante poses – decisions on the bay *free* subscribo gift!! It’s been a minute… and New Collabor88! I made it in to the January Collabor88 on the first night and managed to score a few things, including this top, before crashing. It was late and I was SLing from bed like a proper lazy bum… I gave up after crashing and still haven’t made it back to get the rest of the things I want. I’m still amazed that my lil laptop can run SL at all, so I’m not complaining! I have so many saved outfits to blog, but there seems to be no time to do it lately. Here is another neutral toned outfit.. I don’t usually post without an outfit to blog (so please forgive this one off post).. but I wanted to make sure everyone was aware of this sale! 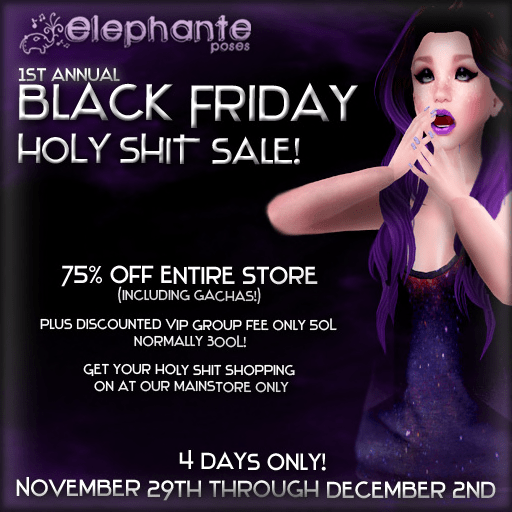 Elephante Poses is having a BlackFriday 75% off sale that lasts until December 2nd! This includes the whole store, VIP group join fee and even gachas!